We are used to hearing this phrase on a plane, or when attending live theatre. Now, it is becoming common at wedding ceremonies too. So what’s the buzz about so-called “Unplugged Weddings”? In these days of technology and social media, where tweets, posts, tags and shares can go viral in a matter of seconds, many people feel the need to take photos and videos constantly – and they can and do! However, a marriage ceremony is an event which deserves respect, since for the couple, their families and close friends, it is a sacred and heart-full, emotional experience. This is obviously best enjoyed with one’s own eyes and ears, rather than through a tiny screen on playback mode or in a Facebook tag. As a celebrant, I believe everyone should be fully present in a marriage ceremony, and able to enjoy the precious nature of the occasion. 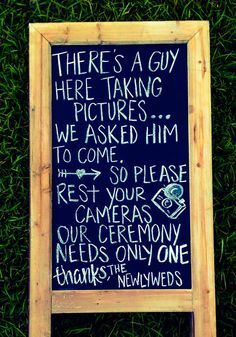 Many of my couples are now specifically ensuring this, by requesting that no photos are taken by guests during the ceremony. It is common for the MC or I to say this before the ceremony starts. Some couples also state it on the wedding invitations, ceremony Order of Service, or on signs at the door of the ceremony venue. There are many ways of asking guests to “be nice – turn off your device”. Like all things wedding-related, whether you want an “unplugged wedding” is a personal choice. While I respect your decision either way – and so should your guests – what I do know is that there will always be a very different vibe in an unplugged ceremony, compared to one where guests are allowed to wave their tiny screens (or large and sometimes noisy lenses) in the air! The couple and I can quite literally sense when the guests are paying full, focused attention to the ceremony, and it feels great! Another reason couples prefer no candid social shots is courtesy to the paid professional photographer, whose job it is to capture great images of the day. You don’t need to look far on the internet to find examples of professional wedding photos ruined by guests! While it may seem funny to casual outsiders, it would not be so amusing if some of your most perfect moments (the “first look” of the groom to his bride walking down the aisle, the first kiss, the flowergirl tickling the pageboy, the newlyweds walking back down the aisle…) are upstaged by a guest’s elbow, head or entire body photobombing the shot, unable to be cropped out! You have usually paid a lot of money to the photographer in the expectation that great photos will be taken; if your guests are stepping in front of the photographer and blocking their view, it is impossible to recreate the moment and recapture the missed shot. I do not believe it is in any way rude, or “precious” to politely explain to your guests that it is your wish that they see your faces, and you see theirs, unimpeded by cameras and iPhones during your ceremony, and in the photographs taken by the paid photographer. Looking back, you want to know that your guests were there with you in that romantic, sacred moment, witnessing something beautiful and feeling it fully. Your love story is the most important part of your wedding day, and by going unplugged, we all become more connected to it.